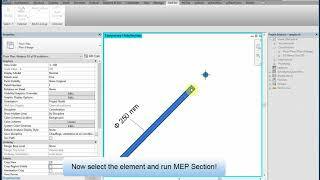 Often during MEP elements modeling, you need many drawing sections which can be a tedious task and, decreases productivity. Using this app, it is easy to choose the object and all the calculations are done with just one CLICK! NOTICE: This is a trial version and you can use it for 10 days. The paid version is also available. You can find it HERE in the app store and also under the BIMODEL apps. You can use this app for 10 days and then if you like it you can buy it from Autodesk Appstore under BIMODEL Publisher. (You must be logged in to Autodesk to use the plugin).